CHICAGO (AP) The Chicago White Sox started against Seattle with the longest streak of hits in the major leagues in more than three years. Jose Abreu had four hits that included a pair of home runs, Yoan Moncada was a single shy of the cycle and the White Sox beat the Mariners 10-4 Monday night to end a seven-game losing streak. Chicago became the first big league team to open a game with seven straight hits since Colorado against the visiting Los Angeles Dodgers on Sept. 17, 2014, according to the Elias Sports Bureau. Moncada’s leadoff triple was followed by five straight singles and Matt Davidson’s double off Mike Leake (2-2) in a five-run first inning. Abreu raised his home run total to six this season with his 12th multihomer game for the White Sox. After getting outscored 27-2 in three losses to Houston, Chicago had a season-high 18 hits. Starting on short notice because Miguel Gonzalez was placed on the disabled list with rotator cuff inflammation, Carson Fulmer (1-1) allowed two runs and three hits in a season-high six innings. The 24-year-old right-hander retired 12 straight before Mitch Haniger doubled in the fifth and Mike Zunino homered. Fulmer allowed four runs in just one inning against Oakland on April 18. Chris Beck, called up from Triple-A Charlotte before the game, finished for his first big league save, giving up two runs and six hits. Leake, acquired from St. Louis last August, did not last five innings for the first time in five starts this season. He allowed eight runs and 12 hits in 3 1/3 innings, raising his ERA from 4.50 to 6.59. Haniger homered for the fourth consecutive game for Seattle and has eight this season. Seattle re-acquired LHP Roenis Elias from Boston for a player to be named or cash. He was 15-20 with a 3.97 ERA for Seattle in the 2014 and `15 seasons. He was 1-0 with a 1.23 ERA in Triple-A Pawtucket this year. Servais said the team had not decided whether to use him in the bullpen or have him start at Triple-A Tacoma. All nine batters in the White Sox lineup hit safely. In addition to the paid crowd of 13,614, there were 530 dogs in attendance for a ”Dog Day” promotion. Mariners: 1B Ryon Healy (sprained right ankle) was 3 for 7 with a home run in two games with Double-A Arkansas last weekend, and Servais said he expects Healy back soon. Healy is hitting .091 in 22 at-bats with the Mariners this season. White Sox: OF Avisail Garcia (right hamstring strain) left after pulling up while running out a ground ball in the second inning. He will be re-evaluated Tuesday. 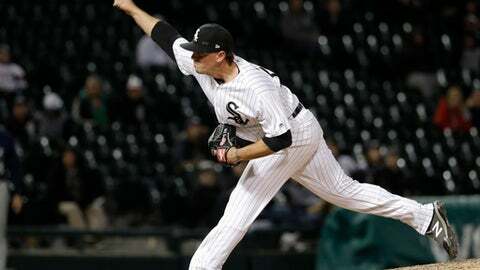 … LHP Carlos Rodon (shoulder) pitched three innings in extended spring training against Cincinnati. Rodon began the season on the disabled list after arthroscopic surgery in September. He is not eligible to come off the DL until late May. Mariners LHP Marco Gonzales (1-2, 5.94 ERA) starts Tuesday against RHP Chris Volstad (0-0, 4.70 ERA).